The secret to knowing what to do with your life – arts, ink. 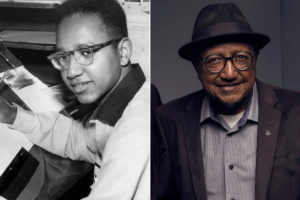 The UMMA presented a documentary about a Disney animator titled “Floyd Norman: An Animated Life.” From the film, the viewers got to know Floyd Norman and his journey with Walt Disney Animation Studios, beginning with his first rejection to being employed to his later rejection. Keep reading to see what I mean. So he went to college. Three years into college, he got a call from Disney, and he was asked, “Do you still want a job? If you do then come to the office at 8am on Monday.” And on Monday he went…and since then still works for Disney. I guess what I learned from this is that getting an education is the most important element to pursuing anything. It’s a platform for everything you might want to do…especially at a school like Michigan that allows for extensive opportunities in various fields. Norman went to college to follow the protocol enforced by his dream job. While in college, he could have continued pursuing what was expected in order to achieve that Disney goal. He could have given up the Disney idea. He could have found a path leading to a future he liked better. This is one purpose of education: verification and exploration and verification. You read that correctly. It took his first rejection to verify that he truly wanted to employment with Disney because he committed to the the crooked, unplanned pathway they assigned to him. What are you willing to do to achieve your dream future? While you have an outline to your goal, you can explore along your way. For example, you may take the credentials for a career in medicine and then realize that you want go into fashion. It’s your life. Do whatever you want. So what if you change your mind. See is as: now you’ve harvested a new skill in knowing science. Knowledge, of any domain, is power…in more ways than one. More importantly, you’ll never wonder what if…you’re purpose will be supported not only by interests, but likewise by the disinterests. I think the latter statement is extremely underrated. Knowing what you don’t like is crucial to narrowing down what you do like. Otherwise, you could be missing a world of interests you overlooked. Exploration does not necessarily indicate a change in goal. It coincides with verification. When you explore, you verify that you want to follow the path you’ve chosen or you verify that you want to change it. This self knowledge gives power to your decisions. Knowledge is power…in more ways than one. The documentary ended and the lights came on. I was going to the UMMA to watch a movie and it was over. Ready to leave, I turned towards the exit when my companion stopped me and gestured to look toward the front of the small auditorium. A man in a black fedora and round glasses walked down the side aisle to the stage under the screen. Floyd Norman, here at Michigan. He stayed for a Q&A session. One point I want to reiterate is his philosophy on growing old. He’s 80 years-old and he says he can’t wait for 90. What an admirable perspective on aging. And the most inspiring part of this UMMA excursion was learning that he was asked to leave work because he was too old. He was furious. So Norman found a way to continue “working.” Most people look forward to their retirement starting as early as…well, now. In college. People are thrilled to stop working. Not Floyd Norman. He found a job that never asked him to work a day in his life. How do you do that?